You either love Jane, or you don’t. Me, I’m a Janeite. 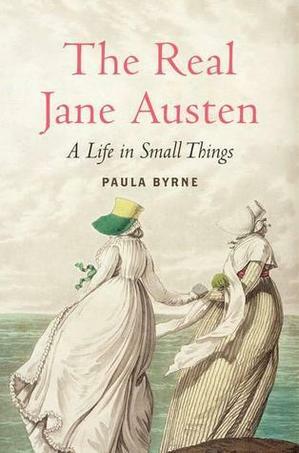 So when a new biography appeared last month titled The Real Jane Austen: A Life in Small Things, I rejoiced! And the good news is that--unlike most of the Austen material flooding the market--this book delivers. It’s a rare biographer who can write a serious book that is immensely readable. For me, the description and study of the objects and the emphasis on material culture makes Byrne’s achievement all the greater. It tugs at my antiquarian side, and as someone who has studied book history, I found her insight into this subject using Austen’s childhood notebooks, a subscription list, a royalty cheque, and Austen’s lap desk encouraging for the discipline. I would love to ask Byrne about the Austen ring sold last year at auction for $236,557. What does that humble gold and gemstone ring tell us about what was important to the author, or what relationship did it inform? Those are the kinds of questions Byrne takes up when she discusses Austen’s topaz cross in chapter 14 or a painted ivory miniature in chapter 11. By rummaging through her “things,” we see Austen at a personal level, and she’s as amazing as ever. You either love Jane, or you don't. Me, I'm a Janeite. So when a new biography appeared last month titled The Real Jane Austen: A Life in Small Things, I rejoiced! And the good news is that--unlike most of the Austen material flooding the market--this book delivers. It's a rare biographer who can write a serious book that is immensely readable. For me, the description and study of the objects and the emphasis on material culture makes Byrne's achievement all the greater. It tugs at my antiquarian side, and as someone who has studied book history, I found her insight into this subject using Austen's childhood notebooks, a subscription list, a royalty cheque, and Austen's lap desk encouraging for the discipline. I would love to ask Byrne about the Austen ring sold last year at auction for $236,557. What does that humble gold and gemstone ring tell us about what was important to the author, or what relationship did it inform? Those are the kinds of questions Byrne takes up when she discusses Austen's topaz cross in chapter 14 or a painted ivory miniature in chapter 11. By rummaging through her "things," we see Austen at a personal level, and she's as amazing as ever.